The Golden Gate Bridge in San Francisco has the highest suicide rate of any structure on earth. Now its authorities are erecting safety nets below the bridge, based on a model that has been successful in Bern. Four seconds is all it takes. Last year 46 people killed themselves by jumping off the iconic bridge. Since it was opened, there have been 1,653 deaths (see box for demographics). What’s more, the statistics only include people who are seen jumping or whose body is recovered. 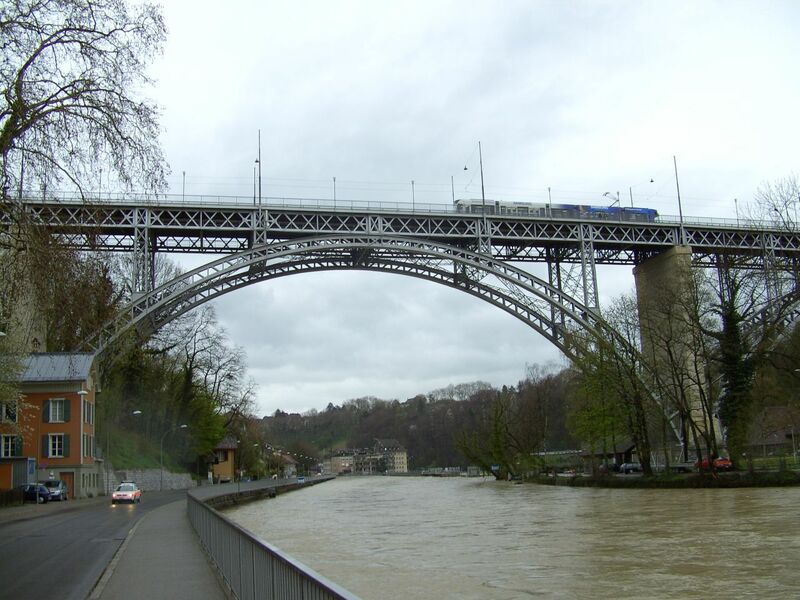 In an attempt to improve the situation, on June 27 a $76 million (CHF68 million) projectexternal link, set to be completed by 2018, was approved to install steel nets six metres under the bridge to catch jumpers. Nets were in fact set up during the bridge’s four-year construction to protect workers and are thought to have saved at least 19 lives. But since then, plans to erect barriers or railings have stalled for various reasons, mainly aesthetic, structural and financial. Explaining the decision, Denis Mulligan, CEO of the Golden Gate Bridge, Highway and Transportation District, referred directly to the experience of Bern’s Münsterplattformexternal link, a popular terrace next to the city’s cathedral with a stunning view over the river – and a 33-metre drop onto concrete. He pointed out, correctly, that since 1998, when nets were built seven metres below the terrace wall, not one person had tried to kill themselves there – only two dogs and several bicycles have had to be lifted out. “It would hurt to fall seven metres onto steel netting. People who are tired of life want to kill themselves but not injure themselves,” Mulligan said. Fears that people would just go somewhere else to kill themselves appear to be wrong. A 1978 studyexternal link traced 515 people who had attempted to jump off the Golden Gate Bridge between 1937 and 1971 but had been physically restrained. The author found that 94% either were still alive or had died of natural causes, and only 6% had committed suicide or died in accidents suggestive of suicide. This supports the idea, stressed by Paul Muller from the Bridge Rail Foundation, which works to stop suicides off the Golden Gate Bridge, that suicide is preventable. “The most important thing is restricting easy access to lethal means,” he said. The Swiss capital is home to several high bridgesexternal link and other structures with serious drops – 30% of suicides in Bern are the result of jumping, usually from bridges. This figure was 60% before the authorities were pushed into taking action in 1998. Between 1996 and 1998 seven people jumped from the Münsterplattform onto the pavement right by a row of front doors. In January 1998, one jumper landed a couple of metres from a ten-year-old boy. By the end of the year the nets were in place. Traumatised passers-by are not the only ones spared. Rescue professionals aren’t faced with the equally traumatic job of clearing up the remains. They also prevent serious injuries among (the few) survivors and the associated health costs. One witness to a suicide was politician Erich Hess, until January president of the Swiss People’s Party’s youth wing and still a member of the Bern city parliament. “I was on the tram going over Kirchenfeld Bridgeexternal link, looking out of the window, when all of a sudden someone jumped. I got out at the next stop and said to myself that the situation wasn’t acceptable – I knew that a lot of people were committing suicide like that,” he told swissinfo.ch. Hess put forward a motion to prevent jumping suicides, which was approved in 2009 by the city parliament. Temporary wire fences were erected up the sides of the Kirchenfeld and Kornhaus bridges (as opposed to nets below them). These fences have had been very effective, with the number of suicides off the two bridges “decreasing drastically”, according to the city government. Exact figures are hard to come by since all parties involved are reluctant to give out details – experts warn that too much information or media coverage could encourage such suicides. But according to Hess, “before the nets almost ten people a year were jumping from the bridges in Bern. This figure is now practically zero”. In February 2014, Bern city parliament voted to spend CHF6.45 million ($7.2 million) replacing the wire fences with “catch nets” similar to those at the Münsterplattform. This will be the model used on the Golden Gate Bridge. The vote was far from unanimous, however, with some politicians complaining about the cost and others concerned about the need to protect historical monuments, given that the two bridges, both built more than 100 years ago, are part of a UNESCO world heritage site. “Saving lives is more important than aesthetics,” was Hess’s response to that. Californian interest in Bern started in 2008, according to Dieter Arnold from Bern’s civil engineering department. That was when they were contacted by the California department of transportation (CalTrans) wanting to know why catch nets had been used on the Münsterplattform instead of fences – and how people who had jumped into them would be got out. “That enquiry concerned the Cold Spring Canyon Arch Bridge in Santa Barbara, not the Golden Gate Bridge,” said Arnold, who presumes the information was then passed onto the authorities in San Francisco. In the end CalTrans built a taller fence and the suicides stopped. Nevertheless, some critics say it is not the job of the state to spend such a lot of money on stopping people commit suicide. “What’s a lot of money? We’re looking at a one-time capital expenditure that will probably last 50, 75 years and in that period another 2,000 deaths would logically happen if nothing is done,” Muller said. The Golden Gate Bridge is a 2.7km suspension bridge spanning the Golden Gate strait in San Francisco, California. It took four years to build and was opened on May 27, 1937. Every day 6,000 bicycles, 120,000 cars and more than 10,000 pedestrians cross the bridge. The road is about 70 metres above the water. After a fall of four seconds, jumpers hit the water at about 120 km/h. Most die from impact trauma. About 5% of jumpers survive the initial impact but generally drown or die of hypothermia in the cold water. As of December 2013, the official death count was 1,653. Paul Muller from the Bridge Rail Foundation, which works to stop suicides off the Golden Gate Bridge, says there could be at least 400 others who jumped and were washed out to sea and never recovered. According to a 15-year study by the Marin County Coroner’s Office, 90% of suicides are from Northern California, the median age is 40, 74% are men, 56% are single or never married, 80% are white, 80% had identifiable occupations and 8% were students. As of July 2013, only 34 people are known to have survived the jump. Those who do survive strike the water feet-first and at a slight angle, although individuals may still sustain broken bones or internal injuries. In the 1990s, more than a dozen yellow emergency phones were installed that went straight through to an anti-suicide helpline. In addition, every day workers drive up and down the bridge in small electric cars on the look-out for people who might be thinking of killing themselves. A total of 1,037 Swiss (752 men and 285 women) killed themselves in 2012. In comparison, 339 people died in road accidents that year. The number of suicides has gradually gone down since the mid-1980s, when more than 1,600 people killed themselves. In a government report from 2009, hanging accounted for 28% of suicides. 23% of suicides shoot themselves, 14% poison themselves, 14% jump from height, 10% jump in front of a vehicle and 11% use another method. Firearm and hanging suicides are much more common among men, whereas women are more likely to commit suicide by drowning, poisoning, jumping from height or jumping in front of a vehicle. The suicides mentioned above do not include assisted suicide.